(Direction 1-5) Study the information given below and answer the questions based on it. Age of Tessa is a cube number and she is elder to Victoria. Amyrah is seated in Upper berth and the person who gets down with Amyrah sits diagonal to her. The age of Gwen is as same as her seat number and doesn’t get down at Surat. The age difference between Amyrah and Nylah is a square of a number less than 4 and Amyrah is younger to Nylah. Zylah and Nylah both sits at Lower berth of different sides. Neither Amyrah nor Tessa goes to Vadodara. The person belonging to same destination doesn’t faces or sits adjacent to each other. Tessa and the person whose age is 20 years less than Victoria are sitting in same berth of the same side. Tessa is an immediate neighbour of Victoria who goes to Delhi. Only one person gets down at Kota and her age is one less than the twice the age of Sasha. Cynthia goes to Surat in upper berth and her seat number is the age of the one who goes to Delhi. The person who goes to Vadodara and Sasha faces each other and the difference between their seat numbers is 1. The difference between the seat numbers of Victoria and the one who goes to Kota is 2. The age of Cynthia is 20 more than her seat number. 1. What is the age of Sasha and where does she goes? As the age of people was prime number and cube numbers ranging from 20-65. The numbers were, 23, 27, 29, 31, 37, 41, 43, 47, 53, 59, 61 and 64. Where 27 and 64 are cube numbers and rest were prime numbers. Age of Tessa is a cube number and she is elder to Victoria. As the age of Tessa is a cube number it may be either 27 or 64. The age of Gwen is as same as her seat number and doesn’t get down at Surat. The age difference between Amyrah and Nylah is a square of a number less than 4 and Amyrah is younger to Nylah. Nylah is 41/31/47. Only square of 2 differences is possible between them from the above prime and cube numbers. The person belonging to same destination doesn’t faces or sits adjacent to each other. Tessa and the person whose age is 20 years less than Victoria are sitting in same berth of the same side. So the age of Victoria may be 61 or 47 from the above ages. Tessa is an immediate neighbour of Victoria who goes to Delhi. 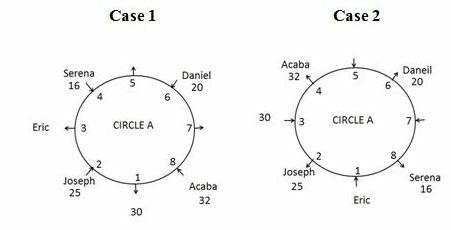 We get two possibilities case –a and case – b. Only one person gets down at Kota and her age is one less than the twice the age of Sasha. Cynthia goes to Surat in upper berth and her seat number is the age of the one who goes to Delhi. The age of Cynthia is 20 more than her seat number. So the only possibility is 47, no other possibility is there from the above ages. As the age of Cynthia is determined we can eliminate the possibility of 47 years from Victoria. So the age of Victoria is 61 and the person sitting in same berth as Tessa is 41 years. The person who goes to Vadodara and Sasha faces each other and the difference between their seat numbers is 1. 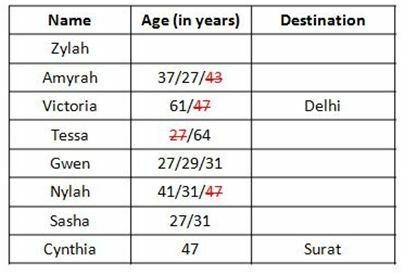 As the person who goes to Kota has one less than the double the age of Sasha, and as Sasha has two possibilities either 27= 54-1= 53 or 31= 62-1=61; Since 61 years is the age of Victoria we can conclude that Sasha’s age is 27 years and the person who goes to Kota as 53 years. Also the age of Amyrah and Nylah is concluded as 37 years and 41 years based on Sasha’s age. Based on the above statement Sasha sits either in seat number 31 or 32 in both cases. Amyrah is seated in Upper berth and the person who gets down with Amyrah sits diagonal to her. 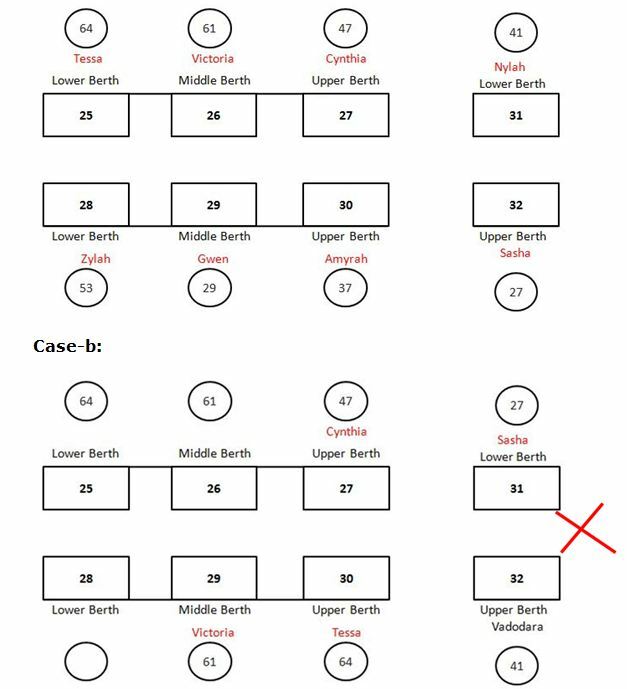 In case-b as there is no possibility for placing Gwen. So, it gets eliminated and Gwen is placed in seat numbered 29 in Case-a. And the place of Amyrah is concluded as seat number 30. Zylah and Nylah both sits at Lower berth of different sides. We can conclude Zylah sits at Seat number 28. Neither Amyrah nor Tessa goes to Vadodara. The difference between the seat numbers of Victoria and the one who goes to Kota is 2. 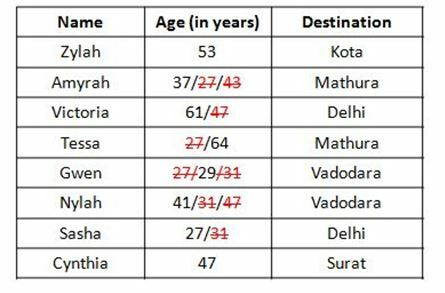 So, Zylah goes to Kota and Gwen goes to Vadodara as it doesn’t goes to Surat. 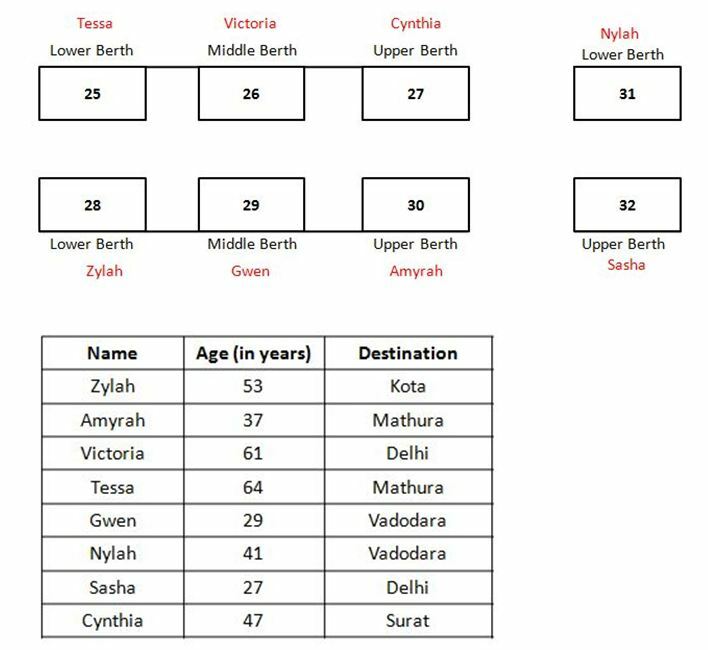 Since not more than 2 people goes to same destination, we can conclude Amyrah and Tessa who is diagonal to her, goes to Mathura. 2. Who among the following faces Gwen? 3. Who are the eldest and youngest people in the compartment? 4. Who among the following is sitting in the seat number-26? 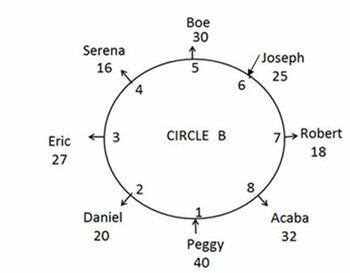 Directions (6-10): Study the information carefully and find out the seating position for circle A and by applying the conditions given below to find out the seating position for circle B. 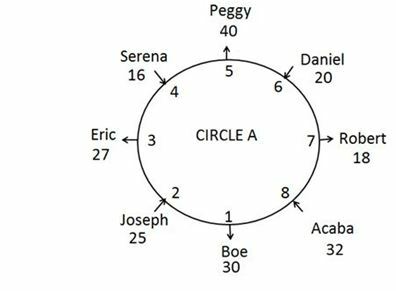 Eight famous NASA Astronauts Eric, Acaba, Boe, Robert, Serena, Daniel, Joseph and Peggy are sitting in a circular table A. Some of them are facing centre and remaining are facing opposite to the centre. Each of them has working for either Falcon 9 satellite or Falcon heavy satellite. The persons who working for same satellite are not sit together but they are facing same direction. The persons who working for different satellite are always sit together but they are facing opposite direction. They are all have different years of experience 20, 25, 30, 32, 27, 16, 18 and 40 in the NASA space centre. All the above information is not necessarily in the same order. The one who have 30 years of experience sits second to the left of Eric. Peggy is the most experienced among them. Serena sits in an even numbered seat and sits second to the left of the one whose experience is square of a number. Acaba and Serena are facing same direction and Acaba’s experience is twice the experience of Serena. The one who has experience of 32 years sits second to the left of the one who has experience of 20 years. Joseph’s experience is four years less than that of average experience of Robert and Peggy. Boe who doesn’t work for falcon 9 satellite, have 3 years more experience than Eric and never sits in seat number 3. Robert doesn’t sits opposite to Boe. Daniel sits in seat number 6. Eric sits third to the right of Daniel. According to the conditions given below, the persons shifts their position from CIRCLE A to CIRCLE B. 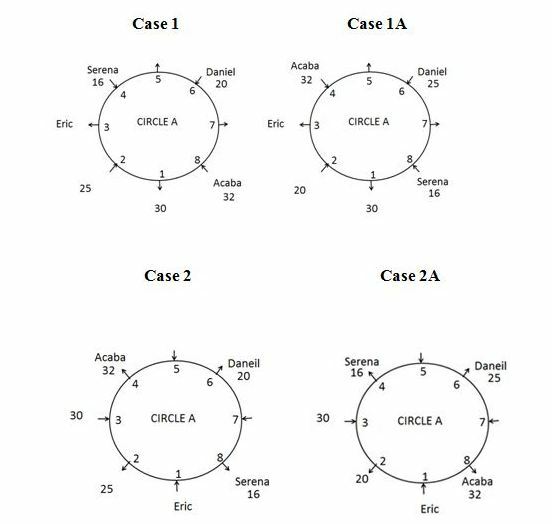 If the experience of Astronauts is multiple of 3 but not a multiple of 5, then, he moves to the same numbered position in circle B and doesn’t change his direction. If the experience of Astronauts is either a Square of an odd number or a multiple of both 3 and 5, then he moves a position that is opposite to his current numbered position in circle B (i.e. Position 2 is opposite to position 6; and Position 4 is opposite to Position 8 and so on.) and doesn’t change his direction. Note: Final arrangement is obtained after all the conditions are applied. All the Questions are based on final arrangement. 6. Who among them is sits immediate right of the one who has least experience ? Daniel sits in seat number 6. Eric sits third to the right of Daniel. Now we clearly understand from the given data that the person who are working for same satellite doesn’t sit together but they are facing same direction and the person who are working for different satellite are always sit together but they are facing opposite direction. Because of these conditions immediate neighbours of Daniel are facing same direction and Daniel and his immediate neighbours are working for different satellite. Hence we can easily find out the directions of all the persons. If Daniel facing centre definitely his immediate neighbours are facing opposite direction of Daniel and also find all the persons directions. Now there are two possible cases. Daniel faces centre or opposite to the centre. Peggy is the most experienced person. So Peggy has 40 years of experience. Serena sits in an even numbered seat and sits second to the left of the one whose experience is square of a number. Acaba and Serena are facing same direction and Acaba experience is twice the amount of time of Serena experience. Already we know that Peggy experience is 40 years. So, Acaba experience should be 32 years and Serena experience is 16 years. The one who has experience of 32 years sits second to the left of the one who has experience of 20 years. Joseph experience is four less than that of average of experience of Robert and Peggy. 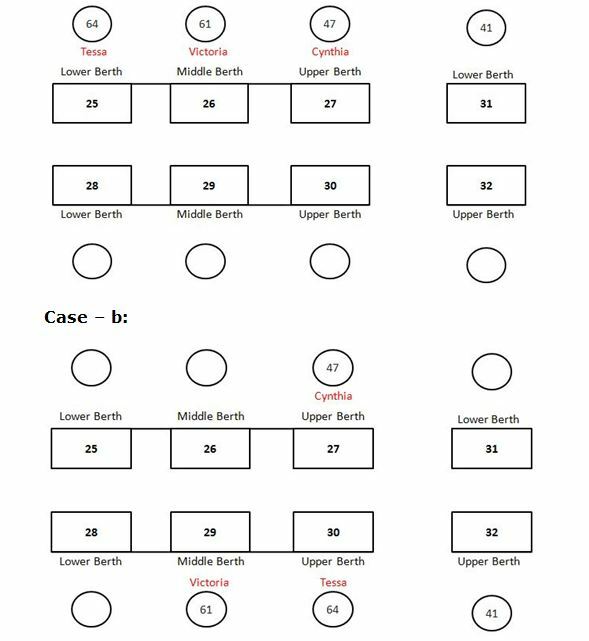 we know that Peggy’s experience is 40 years and unknown experience for case 1 is 25, 30 , 27 and 18 and for case 2-25, 30, 27 and 18 finally for case 1(A)- 20 , 30,27 and 18. From this we can get experience of that person which is four less than that of average of Peggy and Robert by 40 and 18.i.e..((40+18)/2)-4 = 25. Boe who doesn’t work for falcon 9 satellite have more experience than Eric and never sits in seat number 3.Boe is 3 years more experience than Eric. Therefore, only two uncertain experience years we have 27 and 30. From that statement we definitely say that Boe is 30 years of experience and Eric is 27 years of experience. Boe doesn’t work for falcon 9; therefore he must be work for Falcon heavy satellite. If we know the one person’s works then we can easily find out the satellite which all the persons engage their work. (The people who are working for same satellite are not sitting together but they are facing same direction and the people who are working for different satellite are always sitting together but they are facing opposite direction. )and also case 2 is also eliminated. Because Boe never sits seat number 3. Robert doesn’t sits opposite to Boe. 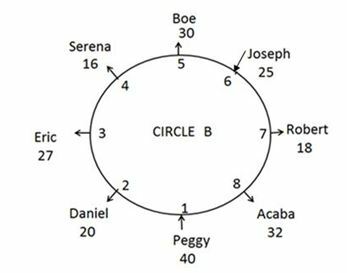 Hence we can conclude that Robert seat number is 7 and Peggy seat number is 5. Also we know the directions of all persons. 7. How many people have more experience than Joseph? Four of the five among the following are similar in such a way to form a group, which one doesn’t belongs to the group? Who sits second to the right of the one who is opposite to 30 years of experienced person among the group? 1) What is the age of Sasha and where does she goes? 2) Who among the following faces Gwen? 3) Who are the eldest and youngest people in the compartment? 4) Who among the following is sitting in the seat number-26? 5) Which of the following statement is true? 1. If the experience of Astronauts is multiple of 3 but not a multiple of 5, then, he moves to the same numbered position in circle B and doesn’t change his direction. 4. If the experience of Astronauts is either a Square of an odd number or a multiple of both 3 and 5, then he moves a position that is opposite to his current numbered position in circle B (i.e. Position 2 is opposite to position 6; and Position 4 is opposite to Position 8 and so on.) and doesn’t change his direction. 6) Who among them is sits immediate right of the one who has least experience ? 7) How many people have more experience than Joseph? 8) Which of the following statement(s) is/are correct? 9) Four of the five among the following are similar in such a way to form a group, which one doesn’t belongs to the group? 10) Who sits second to the right of the one who is opposite to 30 years of experienced person among the group?